January thaw has late arrival. After a couple weeks of wintry weather, a common January weather feature is entering the game – the January Thaw. For centuries, weather watchers have noticed a tendency for a period of milder, calmer weather to hit the eastern half of the U.S. during the latter part of January. This year (it doesn’t happen happen every year) it’s a bit late. We’ve been experiencing a rather weak example of it this week, but it’ll really kick into action by the weekend. Temperatures could reach 60 or so then, but it’ll be even warmer early next week when even 70 degrees is not out of question. A strong storm will come out of the southwest early next week and move northward through the Mississippi Valley. That will bring us strong southern winds and warm, rainy weather Tuesday and Tuesday night. That’ll be it for this year’s “Thaw” as wintry conditions will return by midweek. The “10 year deadline” has passed. Why are we still here? It was 10 years ago this week when former Vice President Al Gore made his (at the time) famous proclamation that if we didn’t make drastic efforts to end global warming in the next 10 years, Earth was doomed. Well, the years have passed, Earth hasn’t warmed (according to satellite data), we haven’t done much to reduce the supposed enemy – carbon dioxide, and everything seems to be rolling along smoothly. Of course, Al’s made a fortune acting as the shill for some climate fanatics, so he’ll be well prepared when the end arrives. 2015 – Hottest Year Ever? Last week our government announced NOAA ‘s and NASA’s findings that 2015 was the warmest year on record. This is based on their analysis of global surface data that they have “adjusted” so many times as to be barely recognizable. But, it fits the agenda. Interestingly, our government also pays two groups to measure Earth’s temperatures. Have you ever heard satellite data discussed during their “hottest this, warmest that” press conferences? No, I didn’t think so. The two satellite groups are GSS (Global Satellite Services) and UAH (University of Alabama-Huntsville). The satellite global temperature surveys began in late 1978 and have closely matched each other over the years. Why haven’t you heard about them? This graph shows you why… Satellite data doesn’t support the agenda. 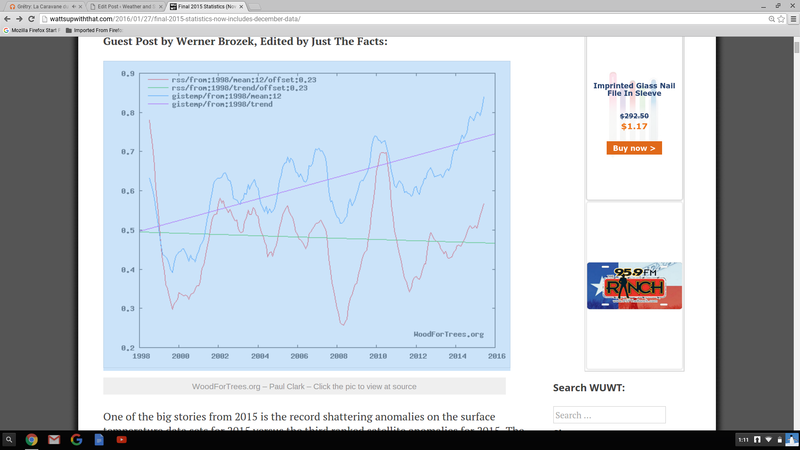 This entry was posted in climate, commentary, forecast, Uncategorized on January 28, 2016 by wx.